Just to update, for those of you praying for our family in this area, my dad’s surgery went really well but we found out recently that the cancer has spread. He will be coming down in a couple weeks for a scan to see how much and where it has spread. Radiation is now on the table as a possible treatment but we don’t know anything else for now. Celebration and sunshine for a snowy April day. We broke out Big Girls precious tea party set and had munchies for lunch this past Sunday afternoon. The newest edition to our set was a tea cozy from Auntie Mirelle. Thanks to our cozy the tea stayed lovely and hot. Big Girls tea set is a collection of love. It is mixed matched smallish dishes that where patiently collected by her Nanny. We keep these treasures wrapped in pretty tissue paper and packaged in a pink velvet box. Big Girl takes great care to unwrap them for each party and wrap them back up when it is time to put them away. Not all the cups are actual tea cups and rarely do they find their matching saucer but we all enjoy them this whimsy way. Near the bottom of the pink velvet box we found custard cups this time and decided they needed to be used. We had no custard but frozen vanilla yogurt made a good stand in and the kids didn’t seem to mind at all. We followed up the tea party with a dance party to this new cd I had been given. My crew just loves it, Baby Boy included. It is funk and they get so happy and bouncy when I put it on, a great way to shake the hyper right out of them on such a day. Wow, it is so much harder to write your own vows. The first time we just read the traditional ones out and this time (for our vow renewal ceremony) we decided, naively, to write our own. I was smart enough to start taking notes, you know, when I am spontaneously inspired and filled with feelings about my man and trying to put this love into words right away. If you think of me pray for the words to come so I can do my love for this man justice. The ceremony is only about seven weeks away! They aren’t profound, just adorable. They where smiling at me from the sales section of a grocer I stopped in at and I had to say hello. Once we said hello I knew they needed to come home, especially since these tiny nesting bowls where on for more then 50% off. Not only are they cheery colors but are a lovely sturdy weight and as you can see they are measuring cups too. Sweet! Hello Handsome, You Goin My Way? Thank you my love for slowing your usually break neck speed for me and my pink cruiser. Thank you my love for taking the paved trails and not the cliffs by the river, for my sake. Thank you my love for buying me a scone because you could tell my temper was just a hint of the sugar crash about to arrive… I don’t get this much exercise on a regular basis yet. Thank you my love for riding on my blind side so I would crash into you and not some other poor soul. Thank you my love for riding near by when it got dark because you have all the night gear and lights and I don’t yet. I don’t know if we have had a chance, before tonight, to go biking in this lovely city of ours as JUST THE TWO OF US! It was fabulous and will be a regular date night idea from now on. We talked and talked as we pedaled together. It was affordable too, just stopped for a coffee at one point and the scenery was free and priceless! The exercise was great! You don’t really appreciate where you live till you get out like this! The city feels so much smaller when you are flying around on a bike. We went all the way from our place to the river and then all the way down the new developed river side parks, to the canoeing club area then back to Broadway for coffee. Made a quick stop at a grocery store on 8th, a practical parent like stop to get a can opener (I busted the handle off mine) then up to a friends to return their house key and back home. It is nights like tonight that I remember Garnet is my best friend as well as my husband. We always had so much to talk about and loved doing everything together, back when we could, back before kids… and we need to be reminded, every now and then, that we LIKE being with one another and LIKE one another. My pink fat tired, fat seat, fat pedal cruiser was waiting for me! I was waiting for the snow to be gone. The bike and I are united! LET’S RIDE! I adore my bike trailer; black and yellow with a big flag and blink-y lights on the back. The littlest two and I get so much joy out of being able to just take off on a bike ride! I don’t know how I did without one! I am a bike rider! I think about it all winter and found it so hard for years not being able to do it very often because of babies. NOW things are so different and we have been going all over town. Sure the trailer is like having a parachute behind me and it gets pretty hard to peddle with a wind but I enjoy the freedom and fresh air in spite of all that. It really is freeing to ride a bike in the city, freeing from all that city traffic and rush… I just feel so good after biking them around town that I can’t wait to get out again. 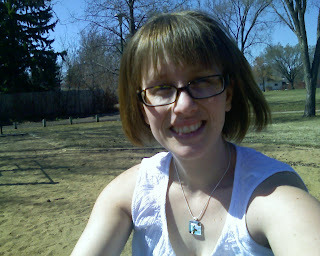 Ah spring, no bugs yet, no intense summer heat yet, SO GRAND! 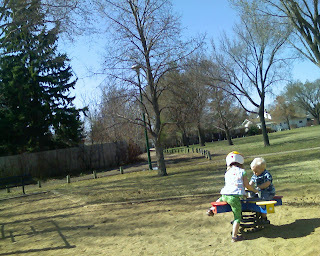 Normally I just want to go go go and can’t stand sitting in the park while Baby Boy and Little Woman play. I want to let them have their exercise but now that they both want me to leave them alone I sit there and can’t handle that for long. Solution? Will you hate me if I admit I like texting… I am sorry, it sure helps pass the time and the kids are happier because I will sit at the park longer. There is something so sweet about sending blurbs through time and space to my sisters, in BC or my sisters right here in the city, while I watch my kids throw dirt at one another. Last year I was such a mess physically and could hardly do anything. This year I am feeling so much stronger; going for long walks and bike rides with Baby Boy and Little Woman, playing basketball and soccer with my Big Boy, skipping rope with my Big Girl. Ah it is easier on the mind to be active. Can you do both at the same time? Yup. Often happens when you take a good look at yourself. Was contemplating the concept ‘working out your salvation with fear and trembling’ and it brought me back, back to the last time I deeply considered that verse and considered the need I had for a good heart spring cleaning. If there had been room I would have also added to the above title “And A Blast From The Not So Distant Past” because I realised some of the same old stuff was cluttering up my heart. Wow I was wondering why I had been feeling so dark lately and it hit me that I am still a person who fears change greatly when it relates to relationships. Change in relationships often means FAILURE to me… I greatly fear letting people down and hurting them! I thank God that he lead me to a post I made during a moment of awakening about this very same fear of mine. I am praying for a soft and loving heart toward what ever Christ has planned this time… praying I will not fight it but will trust my Lord. P.s. This song has been following me around and I finally found out who it is (kept hearing it on the radio) playing it… if you have the time check out Sanctus Real and their song Whatever You’re Doing, it is amazingly reflective of how I am feeling. I DID MY HAIR ALREADY! “Honey I am supposed to be there in fifteen minutes and I haven’t gotten myself ready because I have been dressing the kids!” I said, pleading for him to watch the kids long enough for me to get dressed. I was about to add all I had done so far for myself was get my hair done. Still was in my pj’s otherwise. “Well put a hat on and you will look fine.” he offered. “What?” he is starting to smile nervously. “I did my hair already.” I am trying to look angry but really I find it pretty funny that he got himself into this mess so easily. “Right… ” he bursts out laughing at this point and I laugh too. Boy was he lucky I was in a good mood! I’m in a good mood because he is being such a lovely man this week. He took time off work and out of his holidays to finish the main room in the basement! We should have a tv/play room by the end of the week! My man has been working hard and I find that so romantic!